Completed British 18th C, except portraits, British 19th C, except portraits, Continental European after 1800, Continental European before 1800 14 comments Who painted 'A Musician, and a Lady with a Dog in a Landscape'? This painting is signed in monogram, at the bottom right. See the attached jpeg. The collection has the monogram listed as 'C. D.' in its records, but would welcome further discussion. This discussion has been closed as unsolved, since it has not been possible to identify the artist from the monogram. As with other discussions relating to Museums Sheffield, please post an image of the back of this painting. It is in the vein of Watteau or Lancret, and I suspect it's from the earlier 19th century. For some reason it strikes me as vaguely German despite the French influence, though of course that's conjecture. The painting is in the spirit of Richard Parkes Bonington, especially a work such as https://artuk.org/discover/artworks/anne-page-and-slender-209348/search/actor:bonington-richard-parkes-18021828/page/2. "C.D." may have been another artist influenced by the Troubadour Style of the c.1820s, a type of historical genre painting, seen mainly in French art, showing domestic scenes on small scale. Bonington would seem to be the right period, though I believe his history pictures were typically set earlier than the 18th century, which is what this picture suggests to me. I will certainly take a photograph of the reverse of the work when I am next at the store. Please find attached an image of the back of the painting. Many thanks Museums Sheffield for the image of the reverse. 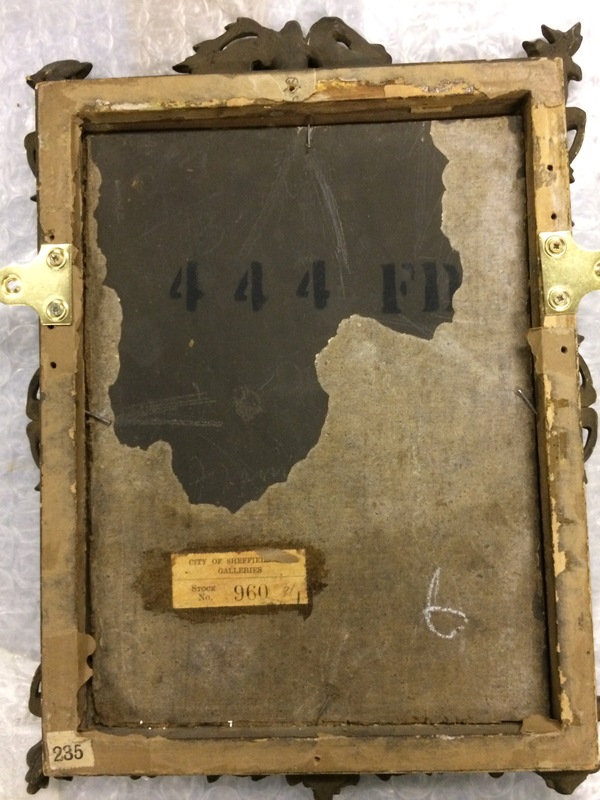 There's definitely a clue here in the form of a nice clear Christie's stencil mark: 444 FD. I'll make enquiries with Christie's Archives to see what this might tell us. 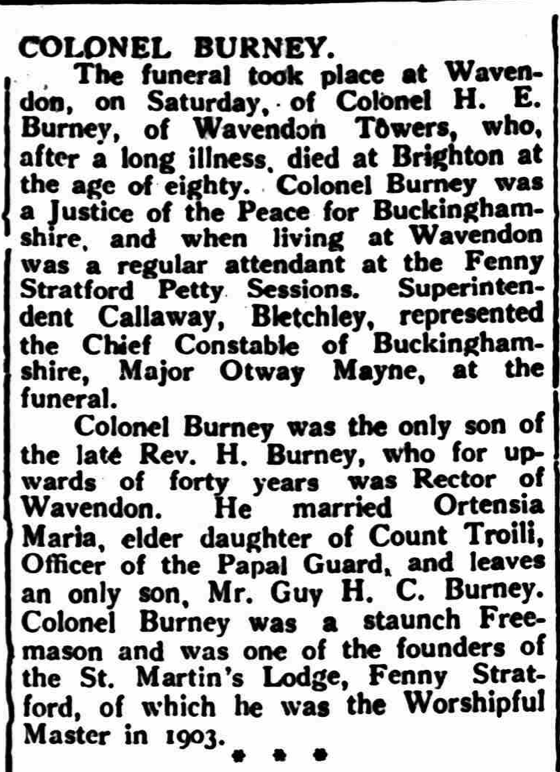 The vendors were C. H. P. Burney Esq., and the Trustees of the Will of the late Colonel Henry Edward Burney. The lot sold for 5 guineas (£5.5.0) to Graves. I have not been able to find the other two paintings -- 'The Minuet' and 'A Youth etc.' -- on Art UK, under Museums Sheffield and either C.D. or unknown artist, and assume they did not form part of the Graves gift. This is welcome information in terms of the work's provenance but, perhaps not unexpectedly, does not take us any further forward with regard to an attribution. 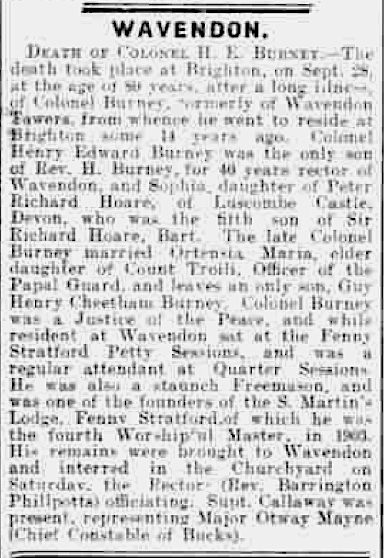 It is interesting, if not a little confusing, that the Christie's sale of 20th June 1920 should have offered works, the vendors of which were the Trustees of the Will of the late Colonel Henry Edward Burney, especially as the Colonel did not die until the 28th September 1924. His obituary notice, from the Bucks Herald of Saturday 11th October 1924, is attached. 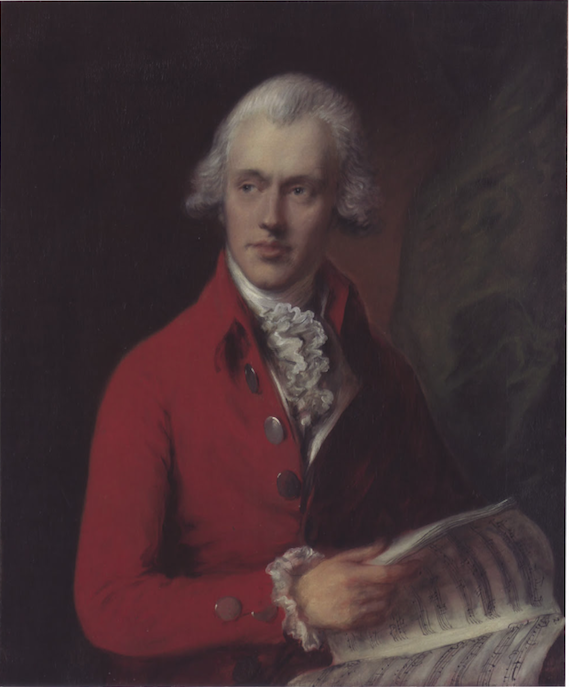 On an a related note to the Cononel, the following link, to Katharine Baetjer's 'British Paintings in the Metropolitan Museum of Art, 1575-1875' (2009) might be of interest, as it mentions the sale of an ancestral portrait, of the celebrated musician Charles Rosseau Burney, by Thomas Gainsborough. This work is now in the collection of the Metropolitan Museum of Art in New York. The Colonel inherited the portrait by descent, and it was sold at his posthumous sale at Christies on the 20th June 1930, as lot number 128, for £4,620.00. Given that the Gainsborough painting, as recorded in this book, is lot number 128 in the sale of the 20th June 1930, and our discussion's painting was one of the three parts of lot number 127 in the Christies sale of the 20th June 1920, could it be that the 1920 date has been recorded in error, and in fact both lots number 127 and 128 were featured in the 20th June 1930 sale? Perhaps Jeff Pilkington could verify or refute this suggestion. Unless time was running backwards, a posthumous sale four years before the death of the Colonel seems improbable, if not a tad impossible. Attached also is an image of the Met's Gainsborough portrait. Forgive the "On an a related" (and any other errors) above. Yet again, it is late and I am not typing accurately! A clearer obituary notice for the Colonel, to the above attached, is here attached. It is taken from the Northampton Chronicle and Echo of Tuesday 7th October 1924. Yes, well spotted - but the 3>2 was probably just a typo by Christie's or Richard. 1920 is clearly wrong, as 20 June 1920 was a Sunday. Given the poor quality of this painting (look at the perspective of the flagstones and the wall behind, for example) I think it is highly unlikely without documentary evidence we will identify the (surely amateur) artist responsible. I recommend we close this discussion as unsolved.